Fig. 1 Foxtail ferns (Asparagus densiflorus 'Myers') are a common sight in my garden. 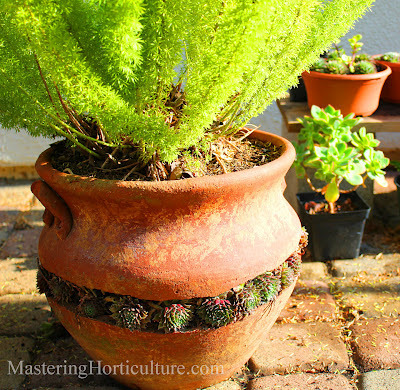 One of my favorite container plants is the Foxtail fern (Asparagus densiflorus 'Myers'). In a pot (Fig. 1), I can move them from one place to another in the yard where an instant color is needed. Foxtail ferns develop vigorous root system along with water storage organs. This feature makes the plant a celebrity-drought-tolerant plant. As a container plant, however, the same vigorous roots system causes a slight draw back. The plant gets root-bound easily. Fig. 2 Pressure from the foxtail fern (Asparagus densiflorus) roots broke the terra cotta pot. The problem. 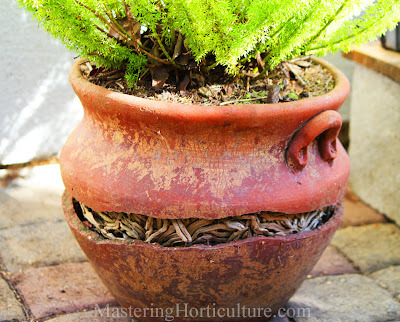 In my garden the super-powered roots of the Asparagus densiflorus defied the shape of its container pot (Fig. 2). It is very obvious that this plant is in a desperate need of more room to grow. Dividing the plant at this point would only mean breaking the already-broken pot. I was not sold to this idea. Fig. 3 Sempervivum-pups in a row. The Solution. I cut off some of the roots that have been dried out from being exposed through the crack - to make room for a little bit of potting soil. 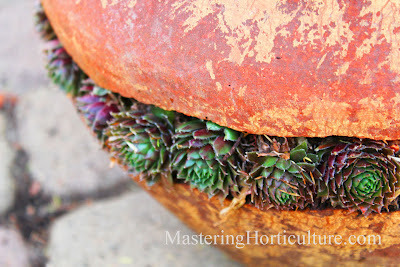 Using sempervivum that are available from my garden, I planted the crack with similarly drought tolerant plants (Fig. 3). Fig. 4 These plants (Sempervivum - hen and chicks) look like they have been there all the time. The outcome. The crack no longer looks like a disgrace (Fig. 4). As soon as the temperatures get warmer, these "ever-living" runners will send their own roots into the thicket to join the foxtail fern's roots. Today, I saw a bird trying to get peck on the new plants which tells me that a wire around the plants might be necessary for the time being. Finally, to avoid such thing from happening in your gardens, divide potted foxtail ferns at least every two years. For bulbous containers like the one I used here (Fig. 2 and Fig. 4) division is even more critical because at a certain point the plant cannot be pulled out without damaging the container. A little bit of imagination can transform some problems into blessings. Fig. 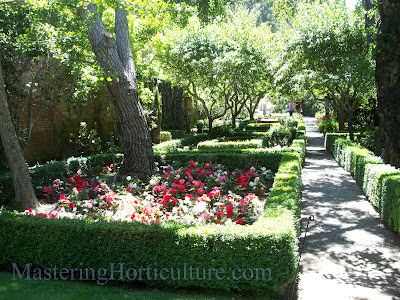 1 Mature plant communities at Filoli Gardens. Gardening is all about harnessing microclimate. After so many years of studying, observing, and putting all techniques learned into practical use in growing plants, I've arrived to the conclusion that the complexity of gardening boils down to understanding microclimate. The magnitude of the effects of genetics and management practices on the overall success of gardening can be enhanced or diminished by the immediate growing environment - microclimate. Microclimate is the unique condition within the immediate surroundings of a given small area. It takes into account the interaction of the following factors: light (intensity, duration), temperature, wind/turbulence, moisture, soil condition, and topography. It is affected by the presence or absence of structures such buildings, pavements, trees, slopes, orientation, and plants around the area. Gardening on the basis of the USDA Hardiness Zone alone is not enough. Every gardener knows that different plants require different conditions for optimum growth. The plants we buy from nurseries come with labels that indicate the most basic and generic condition for growth. The terms full sun, partial sun, partial shade, shade, all suggest a preferred microclimate for the specific plant. Some plants need direct full sunlight while others prefer attenuated sunlight light allowing them to perform best under tall trees (Fig. 1). However, one must consider that a full sun in Seattle may not the same as that in Sacramento. Fig. 2 Eastern side: Growing trees and hedges affect the amount of sunlight and wind turbulence in the garden. Fig. 3 Southern side of the garden. Fig. 5. Location for a bench - shade or sun? The Bench Comparison. In gardening, finding the right microclimate is like finding the right place for a bench (Fig. 5). Depending on the location, one can either enjoy sitting on it or suffer. But then again, it also depends on the goal of the person sitting on the bench. My friend, Sue, would like her bench to be in the sun while I like it to be in the shade. With restraint, both bench positions are good depending on the desired effect. Crassula argentea 'Compacta' under two microclimates. Fig. 6 Grown on the eastern side of the yard. Two years ago I bought a compact mini jade plant (Crassula argentea 'Compacta') in a 3 inch pot. Since then the plant has grown and been divided into two separate plants in 6" pots. One of them (Fig. 6) was located on the east-facing side of the yard. The other one (Fig. 7) was positioned in the south-facing side of the yard where it was exposed to prolonged direct sunlight. It was definitely hotter on this side of the yard; the soil also dried up faster than its east-facing counterpart. Fig. 7 Grown on the the southern side of the yard. There was a sharp contrast between the two plants when it comes to color. More sunlight (Fig 7) resulted in yellowish leaves with very pronounced red leaf margins. Shorter direct sunlight resulted in darker green leaves (Fig. 6). As long as the needs of the plants are all met at the right amount, the two plants function normally but to the naked eye, microclimate within their growing area is reflected through their coloration. These are occurrences that we so often take for granted. But if you think about it, a gardener can actually manipulate the color of these jade plants to suit their preferences by strategically planting them in the right microclimate. Spring is right around the corner and planting season is here. Make sure to re-acquaint yourself with the ever-changing microclimates around your garden. It is the most important consideration in your choice of plants and even timing of activities in your garden. "Sufficient knowledge of your microclimates will help you understand your gardening successes and failures."